In 1963 Ron Meyers was an eager, hardworking entrepreneur "digging for his dough" during the day and working nights for the City of Marshfield to support him and his wife, Patricia Meyers (Burggraf). 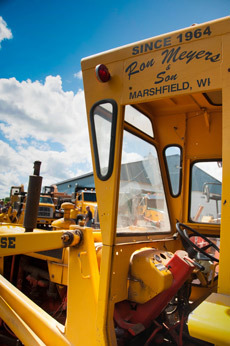 Life was good as a ditch digger, so Ron purchased his first new digger in 1964 and established Ron Meyers Digging. Ron's first shop was located off of Hume Avenue, on land purchased from his in-laws Joseph and Frances Burggraf. We dig the Red Panthers Girls Hockey Team. Good luck on your season! Excavating / digging were not the only services that Ron Meyers Digging offered; Ron assisted with sewer work since 1954 and obtained his plumbing license with his years of plumbing experience. Ron has replaced and installed many water and sewer laterals in the city of Marshfield and the surrounding communities. Ron and Pat had one son, Mark who worked regularly with his father since 1985. After graduation, Mark partnered with his father in 1989 forming Ron Meyers and Son Digging. Mark obtained his restricted plumbing license in 1994, allowing Ron Meyers and Son to expand into septic / holding tanks and mound systems. In 2004, Ron Meyers and Son expanded once again. First the business moved from Hume Avenue to the current location at M431 East McMillan Street. Then Mark partnered with his grade school friend, Mark Nelles to establish On the Mark Trucking. This trucking partnership allowed Ron Meyers and Son to expand into landscape and aggregate materials, which can be delivered or picked up by the customer. 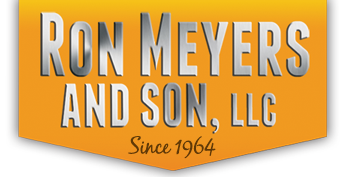 Ron Meyers and Son is a family run business since 1964. All stages of jobs are completed by the owners. No job is too small, as Mark and Ron have multiple sized equipment to complete jobs of all sizes. ©2015 Ron Meyers and Son, LLC.